New Sod Installation Guide | LawnPro Landscapes LTD. 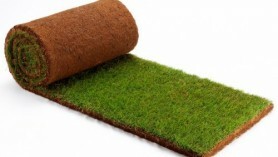 Here we have put together a care guide for homeowners who have just installed new sod for their home. This guide is intended to answer any questions you may have about the proper care and best practices to keep your new grass looking its’ greenest! It should be thoroughly watered until the sod and dirt below are soaked. For the first 2 weeks, apply ¾ to 1 inch of water daily, depending on the weather. The best time to water is in the early morning so less water is lost to evaporation. Lawns watered too frequently tend to develop shallow root systems, which may make them more susceptible to grub damage and heat stress. Once the sod has developed a root system, watering can be cut back to every other day for another couple of weeks. Once the root system has fully developed, the sod can be put on a regular watering schedule. A typical established lawn requires ½” to ¾” of water twice per week. Grass Cutting. After 2 weeks! Let the lawn dry like you normally would before you mow to avoid making tracks. Set the mower on the highest setting so as not to scalp the sod sending it into shock. Begin to mow, making sure to bag the clippings. The new lawn should be mowed on the higher setting for a few weeks before resuming your normal mowing height. Never cut more than one third of the height in a single mowing or you can shock it. Established grass is usually mowed at 2 ½” in the spring and fall and at 3” in the summer. By setting the ½” higher in the summer (June, July, and August), you help keep the plant cool reducing stress. After installation we recommend putting your lawn on a regular fertilization schedule. Fertilizer, whether chemical or organic, provides the basic building block for a healthy lawn. The bare minimum number of applications is 2 applications, with fall being the most important. LawnPro Landscapes Ltd. and Weed Man will often apply fertilizer to a lawn 3-4 times during the growing season. The reason is that not the same fertilizer is used with each application. Professional lawn fertilizers are specially formulated for the different times of the year. Some fertilizer applications are blended for root development while others are formulated for developing healthy leaf growth. Q. Why is my Sod not rooting into the soil? A. Most sod varieties will begin rooting within 10 — 14 days. Check watering schedule and adjust to a deeper, less frequent watering. Shade will also slow down the establishment of the roots. Q. Why are there bluish or grey spots in the new Sod? A. Sod may be stressed because of lack of water or intense heat during the summer months. Increase watering and check or adjust sprinkler coverage. Q. Why are there gaps between the Sod pieces? A. Sod is shrinking due to lack of water and prolonged exposure to heat! Try increasing water and frequency to help minimize gaps between the rolls. Topdressing and over seeding the gaps may be required to help fill them in. Q. Why is there mushrooms growing all over the new sod? A. Mushrooms are a condition of the frequent watering schedule and organic material in the soil and are a temporary nuisance. As watering gets deeper and less often, mushrooms usually dry up and wither away. For more information, or to setup a lawn care package, please see our website at www.lawnpro.ca or call our Weed Man division at 604-795-4600. LawnPro Landscapes LTD Chilliwack Fraser Valley British Columbia Landscaping Lawn Mainteance Design Hedge Trimming Strata Residential Commercial Copyright 2012 LawnPro Landscapes LTD.